Triphala is a popular polyherbal drug, which has been used to treat long list of diseases in the traditional systems from the ancient times. Acharya Charaka mentioned in his text as daily consumption of the triphala for a period of one year, is act like rasayana, makes a person live for hundred years. Triphala is a composite mixture of three herbs Amalaki (Emblica officinalis), Haritaki (Terminalia chebula) and Vibhitaki (Terminalia belerica) also known as the ‘three myrobalans’. Emblica officinalis Gaertn belongs to Euphorbiaceae, and Terminalia chebula Retz. Terminalia bellerica belongs to Combretaceae family. The generic name ‘Terminalia’ comes from Latin word ‘terminus’ or ‘terminalis’ (ending), and refers to the habit of the leaves being crowded or borne on the tips of the shoots. Throughout the world, there are lot of studies carried out on this, well established the knowledge and documented. Triphala is rich in Vitamin C, gallic acid, ellagic acid, chebulic acid, bellericanin, β-sitosterol and Flavonoids etc and a potent laxative, immumo modulator, antioxidant, antimicrobial, traditionally been used in eye diseases, stress, arthritis, colon diseases, etc. Present paper deals with antioxidant effect of individual plants and its combination (Triphala). 1. Chaturvedi N, The burden of diabetes and its complications: trends and implications for intervention. Diabetes Res Clin Pract. 2007;76: S3-12. 2. Namrata Agarwal, Pritam Sadhukhan, Sukanya Saha and Parames C Sil, Therapeutic Insights against Oxidative Stress Induced Diabetic Nephropathy: A Review, Journal of Autoimmune Disorders, 2015; 1(1:2):1-16. 3. V. Bauer, R. Sotnikova, J. Machova, S. Matyas, V. Pucovsky and M. Stefek, Life Sci., 1999; 65, 1909. 4. G. U. Bae, D. W. Seo, H. K. Kwon, H. Y. Lee, S. Hong, Z. W. Lee, K. S. Ha, H. W. Lee and J. W. Han, J. Biol. Chem., 1999; 274, 32596. 5. Pal S, Pal PB, Das J, Sil PC, Involvement of both intrinsic and extrinsic pathways in hepatoprotection of arjunolic acid against cadmium induced acute damage in vitro. Toxicology. 2011; 283: 129-139. 6. Sugamura K, Keaney JF Jr, Reactive oxygen species in cardiovascular disease. Free Radic Biol Med. 2011;51: 978-992. 7. Feng Y, Wang X (2012) Antioxidant therapies for Alzheimer's disease. Oxid Med Cell Longev. 2012: 472932. 8. Indo HP, Yen HC, Nakanishi I, Matsumoto K, Tamura M, et al. A mitochondrial superoxide theory for oxidative stress diseases and aging. J Clin Biochem Nutr 2015; 56: 1-7. 9. J. M. C. Gutteridge, Chem.-Biol. Interact. 1994; 91, 133. 10. S. J. Jadhav, S. S. Nimbalkar, A. D. Kulkarni and D. L. Madhavi, in Food Antioxidants: Technological, Toxicological and Health Perspectives, ed. D. L. Madhavi, S. S. Deshpande and D. K. Salunkhe, Marcel Dekker, New York, 1996; 5–64. 11. Matough FA, Budin SB, Hamid ZA, Alwahaibi N, Mohamed J The role of oxidative stress and antioxidants in diabetic complications. Sultan Qaboos Univ Med J 2012; 12: 5-18. 12. Forbes JM, Coughlan MT, Cooper ME Oxidative stress as a major culprit in kidney disease in diabetes. Diabetes 2008; 57: 1446-1454. 13. Lee WC, Wang CJ, Lee HJ, Antioxidants in Decelerating Diabetic Nephropathy: INTECH Open Access Publisher, 2013. 14. Gao P, Li L, Ji L, Wei Y, Li H, et al. Nrf2 ameliorates diabetic nephropathy progression by transcriptional repression of TGFß1 through interactions with c-Jun and SP1. Biochim Biophys Acta –Gene Regulatory Mechanisms. 2014; 1839: 1110-1120. 15. Sun L, Li W, Li W, Xiong L, Li G, et al. Astragaloside IV prevents damage to human mesangial cells through the inhibition of the NADPH oxidase/ROS/Akt/NF-?B pathway under high glucose conditions. Int J Mol Med. 2014; 34: 167-176. 16. Zhang Y, Wu G, Hu X, Zhang J, Effect of Cyclophosphamide on Expression of MMP-9 and TGF-β1 in Renal Tissue of Rats with Diabetes Mellitus. Cell Biochem Biophys. 2015. 17. The Ayurvedic pharmacopoeia of India, Ministry of health and family welfare department of Ayush. part- I volume – I, Page 7. 18. The Ayurvedic pharmacopoeia of India, Ministry of health and family welfare department of Ayush. part- I volume – I, Page 62. 19. The Ayurvedic pharmacopoeia of India, Ministry of health and family welfare department of Ayush. part- I volume – I, Page 33. RAO, Pundaree Kaksha. ANTIOXIDANT EFFECT OF TRIPHALA:CRITICAL REVIEW. 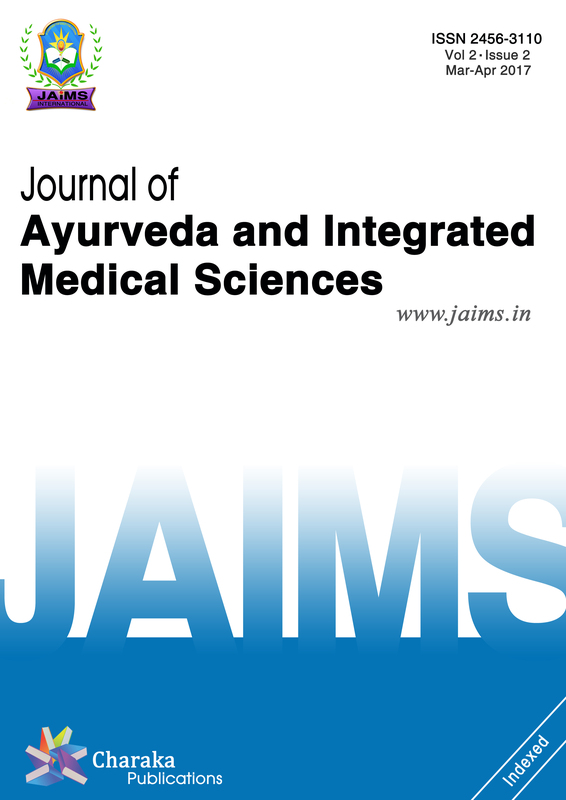 Journal of Ayurveda and Integrated Medical Sciences (ISSN 2456-3110), http://www.jaims.in/index.php/jaims/pages/view/Citation, v. 2, n. 1, p. 213 - 219, mar. 2017. ISSN 2456-3110. Available at: <https://www.jaims.in/index.php/jaims/article/view/154>. Date accessed: 19 apr. 2019.